We left UMW’s newly commenced Bukit Raja assembly plant on a more positive note. The RM1.8bn new plant has a capacity of 50k units p.a. (to cater for small size cars) with much improved efficiency and production quality. The expected increase in depreciation (RM60m) and finance cost (RM30m) will be partially offset by the improvement in gross margin. We maintain SELL recommendation with unchanged TP: RM4.80 based on 10% discount to SOP: RM5.35, as we believe UMW’s valuation is relatively high and we have concerns on the impact from USD appreciation and cautious consumer sentiment. RM1.8bn capacity expansion. UMW’s 51% owned UMW Toyota-ASSB (UMWT) has invested RM1.8bn (Debt:Equity @ 33.3%:66.7%) on a new assembly plant in Bukit Raja (BRP) with a production capacity of 50,000 units p.a. (single shift) to complement its existing assembly plant in Shah Alam (SAP) with a production capacity of 38,000 units p.a. (single shift). BRP is designed specifically to cater for small size cars (for platform up to C segment) i.e. Vios and Yaris, while UMWT planned to maintain the assembling of larger platform model i.e. Hylux, Innova and Hiace in SAP. A better BRP vs SAP. BRP is a more efficient plant with improved production quality as compared to SAP. Overall BRP has automation rate of 70% vs. SAP’s 30%. Comparing Vios production, BRP’s TAKT time (average time between the start of production of one unit and the start of production of the next unit) is currently 5.7 minutes and can be improved to 4.5 minutes (depending on demand requirement), as compare to SAP’s range of 5.9 to 11.9 minutes. The production quality rate has also improved considerably at 0.1 for BRP (based on shipping quality standard), vs 0.5 for SAP. Moreover, BRP is equipped with adjustable jigs to fit for different models, which will reduce jig costs over the longer time, as compared to SAP’s requirement of investing new set of jigs for each different model. Increased local content. The localization of the new Vios assembling has increased to 80% (in terms of value) from previous generation of only 50-60%. The higher localization rate is driven by the engine and transmission sourcing from Daihatsu Perodua Engine Manufacturing and Akashi Kikai Transmission Plant in Sendayan. Both Toyota Vios and Perodua Myvi share the similar engine and transmission. The body platform and structure are partially sourced from Thailand at c. 60%, while the remaining 40% from local. Upcoming new Yaris model (to be assembled in BRP) is expected to have similar 80% localisation rate. Future expansion. Management guided the production capacity in BRP can be easily doubled to 100,000 units p.a. with minimal additional capex, as UMWT has already allocated vacant land area next to each production buildings for future expansion purpose. Financials. While the breakdown of BRP’s RM1.8bn investment cost was not given, we estimate RM570m for land acquisition and RM1.23bn for plant and machinery and a financing cost of 5% for RM600m. We expect additional depreciation charges of RM60m p.a. and finance cost of RM30m p.a. from BRP. UMWT is also budgeting up to RM100m to refurbish SAP to improve its efficiency. Nevertheless, the cost savings from the more efficient plant may improve UMWT’s gross margin to partially offset the higher depreciation charges and finance cost. Maintain SELL, TP: RM4.80. Maintain SELL recommendation on UMW with unchanged TP: RM4.80 based on 10% discount to SOP of RM5.35. 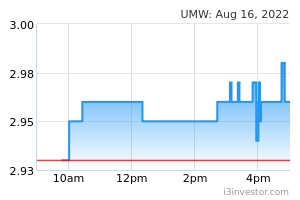 We believe UMW’s valuation is relatively expensive as compared to its automotive peers with unattractive dividend yield. Furthermore, we are concerned on the impact of RM depreciation and cautious consumer sentiment on UMW.